This entry was posted on Sunday, March 3rd, 2013 at 10:07 am and is filed under Employment density, Melbourne, Mode share, Mode shift. You can follow any responses to this entry through the RSS 2.0 feed. You can leave a response, or trackback from your own site. 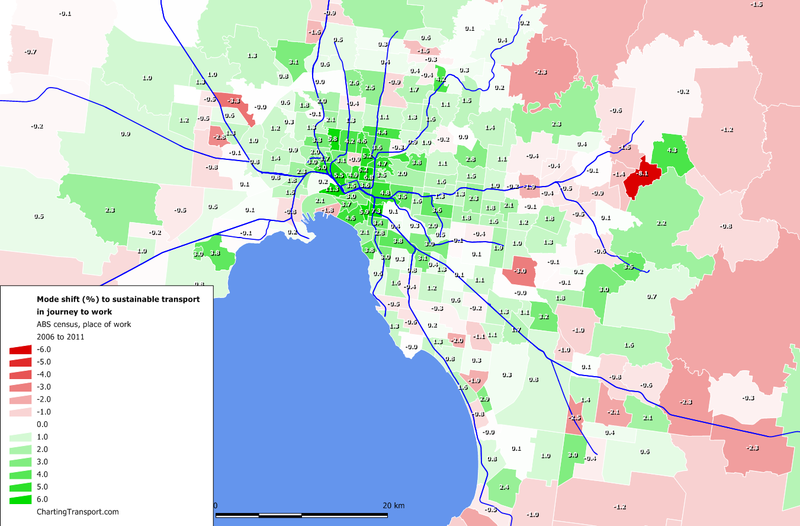 I’m wondering whether the increase in people using public transport is the result of the Laverton rail upgrade. This has probably lead to more people using trains. By contrast, the people on the Altona loop have decreased slightly due to the terrible service. 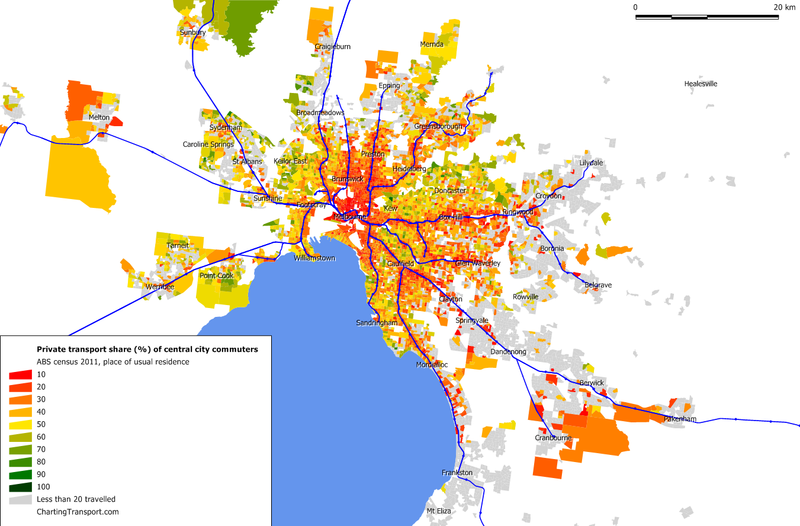 So has cycling in the Altona area – there are now more people driving to work. Thanks for the insight, it is great. Thanks for a most interesting set of graphs. 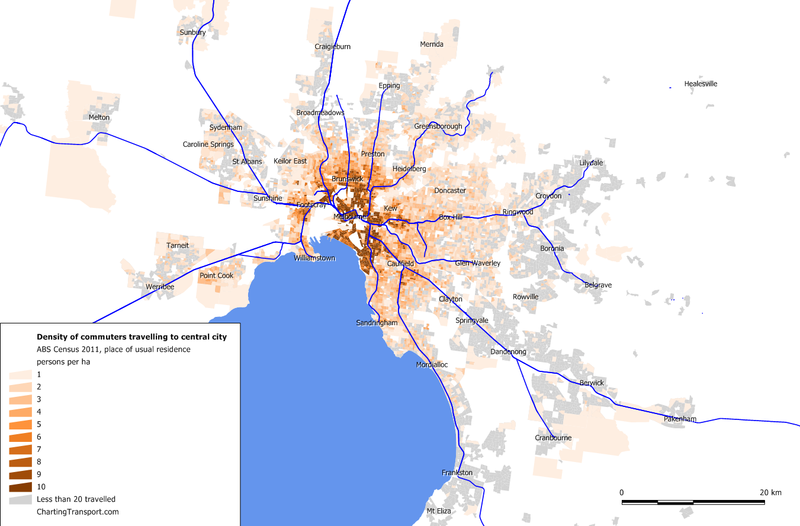 I am curious about the pockets of possibly 100% mode shift around Weribee and Pakenham for public transport commuters travelling to central city when the same sectors seem to have 20-30% private transport on a subsequent graph. I would be interested in your interpretation of this. Hi Margaret, thanks for spotting that. ABS randomises the data when numbers are small and the randomisation “errors” were compouding a little in SA1s with small numbers of people travelling. 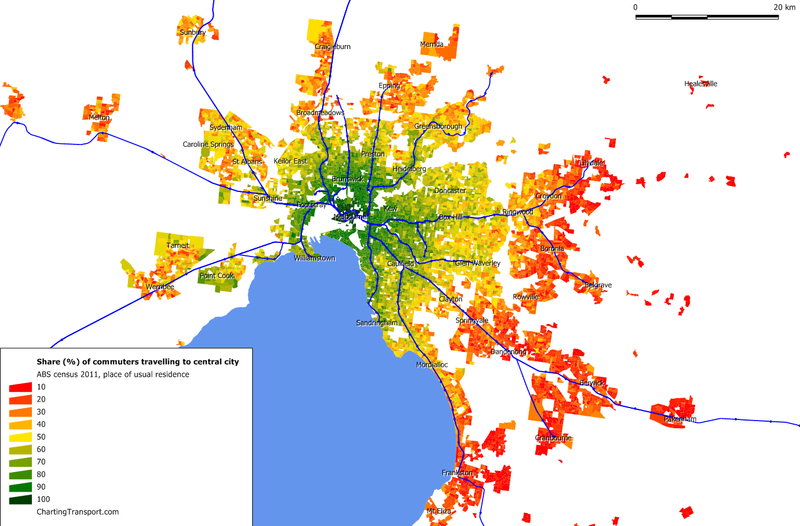 I’ve re-extracted the data from ABS to reduce randomisation errors and have updated the maps in question (only slight changes). Fantastic work as per usual. Again showing the rising importance of public transport and cycling. Shame the State Government seems to have ignored all of this in their planning scheme discussion document. 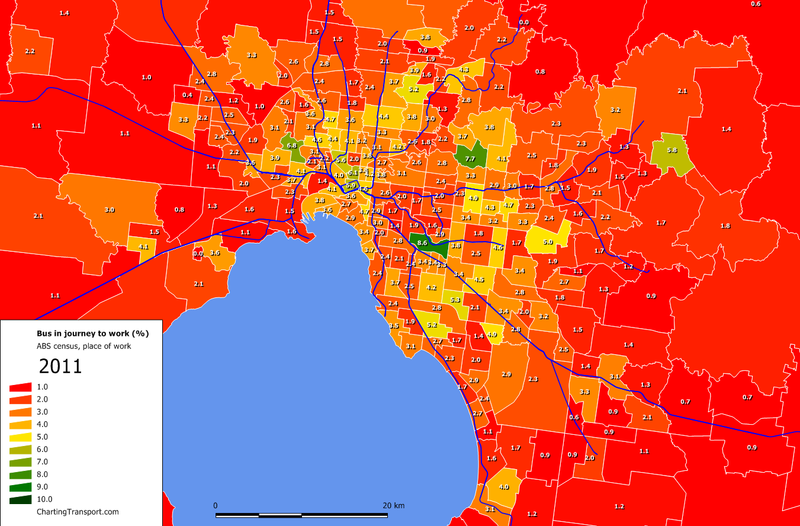 Note your areas of high car use are typically well away from Train lines. West Kew may be wealthy but the tram takes and excruciating long time to and from the city in peak periods. So cars provide some time savings and more comfort and flexibility. I feel this is a bigger factor than wealth. 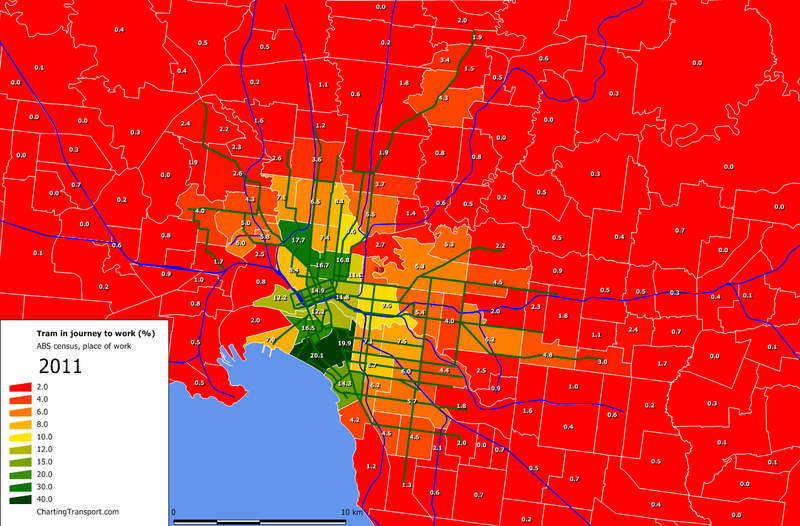 Looks like Monash University’s SA2 has only received a 1% increasein people using public transport, to 6.8%. A pretty disappointing figure with the commencement of the 601 non-stop service, which to my knowledge cut nothing else. Do these figures include students, or just workers? Perhaps the 601 is filled up with students who are now able to use PT? 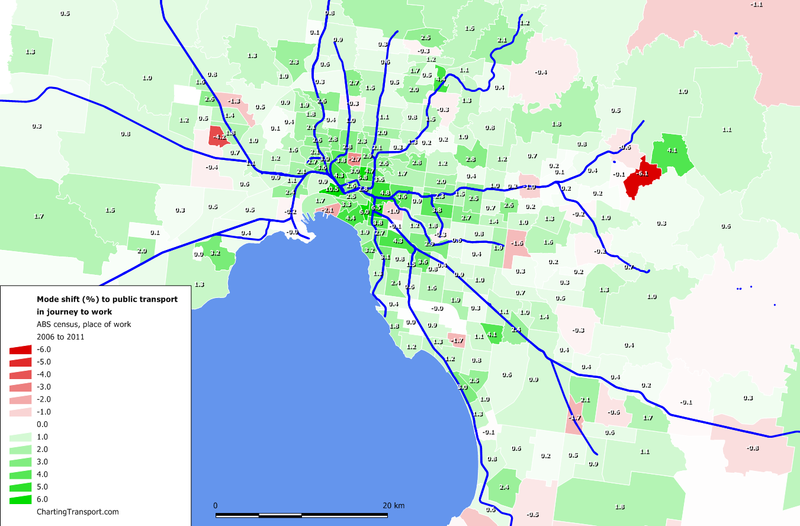 Other observation I’d make is that it seems that the Glen Waverley line is an exception to the rule that people close to the train line don’t drive to the CBD. 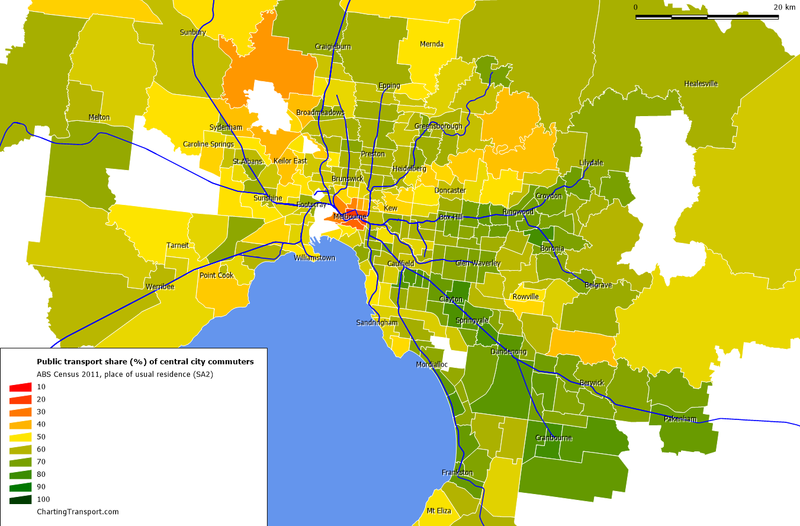 Seems like that shows people are unhappy with their services not using the city loop any more. 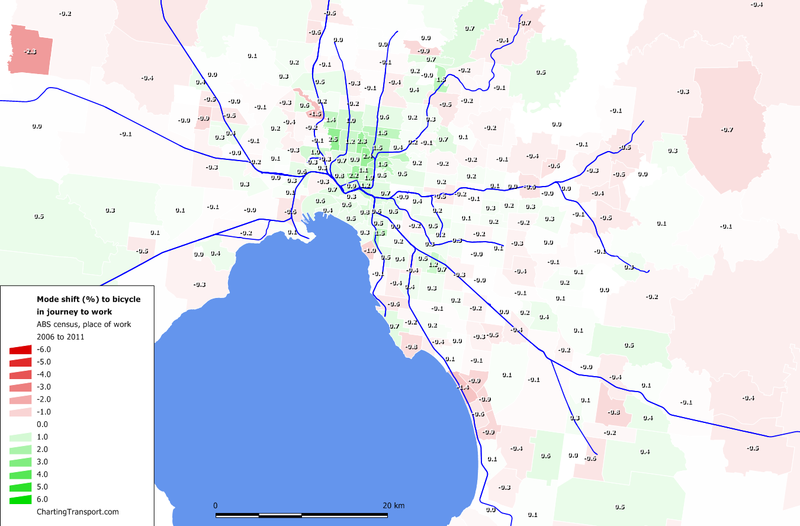 It is more obvious here than for lines which have never (AFAIK) used the city loop in peak such as Sandringham. 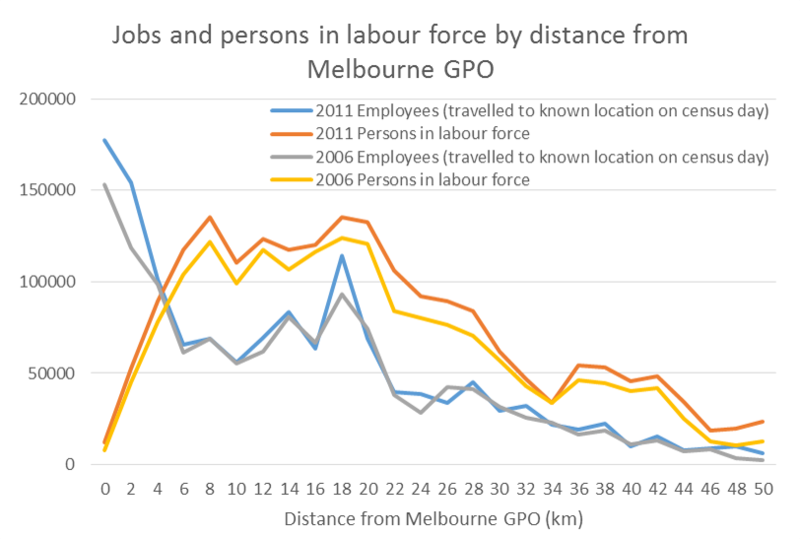 The Census asks only about journey to work not study, unfortunately. Hopefully future Censuses will include travel to study. The 601 way only just over a month old in 2011 and a in future a greater mode shift may show up. 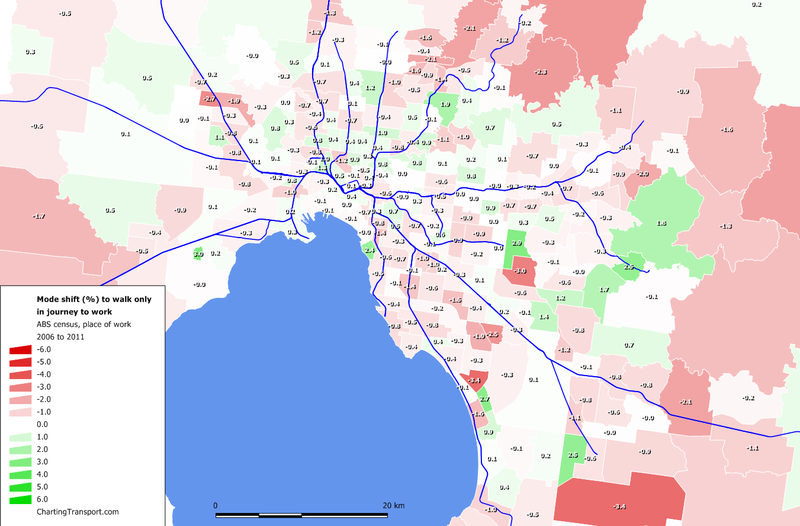 Remember that Monash is not the only employer in that district as there are quite a few so the mode shift caused by the 601 is diluted. 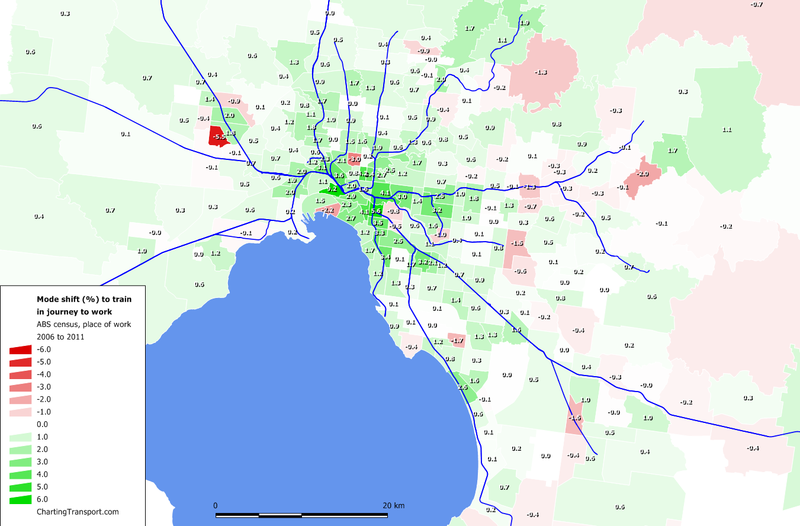 I would think that part of the reason that the PT mode share in Docklands has increased in that some of the Development has been closer to Southern Cross station (Notably Collins St) as well as an increase in permeability, decrease in desolate wastlandness and increase in employment density as the development progresses.